Eric Harris: Democrats are skeptical of Mike Pompeo. But confirming him may improve U.S. foreign policy. Eric Harris Democrats are skeptical of Mike Pompeo. But confirming him may improve U.S. foreign policy. The State Department and U.S. diplomacy are in disarray. Can the president's nominee really be worse than Rex Tillerson? CIA Director Mike Pompeo, with his hawkish views, skepticism of diplomacy and Islamophobic positions, struck most observers as a shoe-in to replace Rex Tillerson as secretary of state. 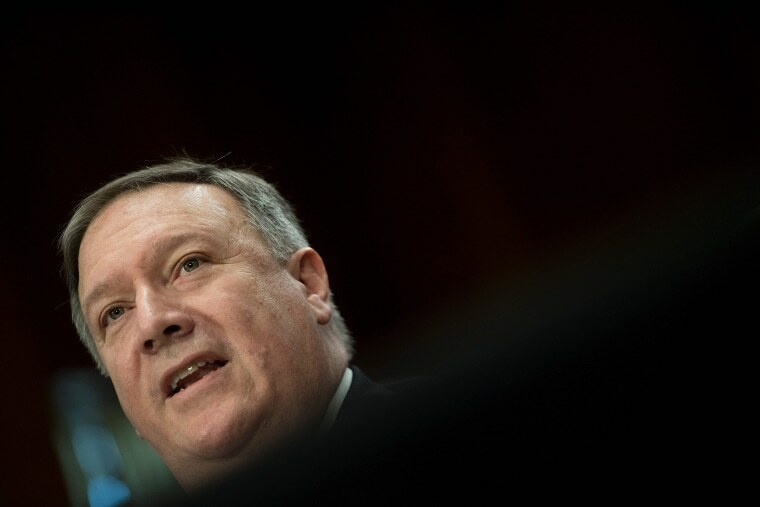 And, despite a contentious confirmation hearing marred by evasive responses and contradictory statements about Iran, Russia and North Korea, Pompeo’s future appears to be certain. Pompeo, however, may offer something that former Secretary of State Rex Tillerson, in his short tenure, never could: A mutually respectful relationship with President Donald Trump. This good rapport might not sound like much on the surface, but for a State Department reportedly concerned about our fractured diplomatic relations worldwide, such a bond could prove to be a valuable asset. Having a secretary of state who can convince the president that there’s more to learn in the world than he already knows can’t help but benefit our foreign policy. What we see with our own eyes, suffused with emotion and lodged in our memory, most strongly influences our perspectives. Firsthand experience is by far the best teacher. In its absence – and it is indeed absent from Trump – fallacies and fictions can too easily fill the void and lead to error. And having a secretary of state who can convince the president that there’s more to learn in the world than he already knows can’t help but benefit our foreign policy. That wasn’t the first time Trump changed his tune after a presidential visit. Remember the president’s friend “Jim” from the campaign trail? For those who need a refresher, “Jim” was a “very substantial guy” whom Trump cited as saying he would no longer set foot in Paris because immigrants had made the city too dangerous. Playing to an audience at the Conservative Political Action Conference, Trump relayed a conversation where “Jim” said, "I don't go there anymore. Paris is no longer Paris." But there was no “Jim.” Multiple news outlets were unable to locate him or confirm his existence. Trump invented him to reinforce his nationalist narrative and denigrate France and French policy. Pompeo may offer something that former Secretary of State Rex Tillerson, in his short tenure, never could: A mutually respectful relationship with President Donald Trump. Today, the president believes America’s relationship with France is “stronger than ever.” And he’s not alone. Many foreign policy experts consider France the administration’s closest ally in Western Europe. On the second day of Macron’s first state visit, the personal bond shared between the two leaders was on full display as Trump – despite years of opposition to the Iran nuclear deal – suggested a willingness to preserve the agreement. "We understand each other, and we'll see how that comes out," Trump told reporters. "We could have at least an agreement among ourselves fairly quickly. I think we're fairly close to understanding each other, and I think our meeting, our one-on-one, went very, very well." Which brings us to the entire continent insulted in January after Trump asked why America would embrace immigrants from “shithole countries" during an Oval Office meeting. And it’s not been his only Bronx salute to the 54 countries of Africa: During his short time in office, Trump has tried to gut agencies and programs that have been saving African lives for years. His 2018 budget proposal slashed international education spending by 52%, cut $800 million from our global efforts to eradicate HIV/AIDS; called for the dismantling of the African Development Foundation, a federal agency supporting African-led development; and his administration’s travel ban bars individuals from three Muslim-majority African countries: Libya, Sudan, and Somalia. Tillerson was in the midst of an apology tour across Africa – his first as the nation’s top diplomat and the highest-level visit by an administration official – when he was fired. The State Department pitched the trip as a mission to hear the concerns of African leaders. In reality, it was an effort to rebuild bridges burned down by a nationalist president’s uninformed worldview; that effort was obviously put on pause when Tillerson left. If this administration truly wants to repair its strained relationship with our African partners, the next secretary of state must persuade Trump to do something he’s never done before: Make a presidential visit to Africa. But it’s important because strong relations with the region are central to America’s global security interests as well. There are roughly 6,000 U.S. servicemembers currently deployed across the continent, many of whom are protecting the region from ISIS-linked and other insurgent groups. And our counterterrorism partnerships with African militaries help conduct peacekeeping missions and quell the spread of extremism, giving African countries the opportunity to build their own economies in peace, free from the fear of violence. This doesn’t just make Africa a safer place; it makes the world a safer place. But if this administration truly wants to repair its strained relationship with our African partners, the next secretary of state must persuade Trump to do something he’s never done before: Make a presidential visit to Africa. I have no doubt that Trump’s belligerent approach to foreign policy arises from ignorance and apathy. A change in words alone won’t repair our diplomatic ties, but a course correction in policy and attitude can. And the first step, as already demonstrated with France and Israel, is getting President Trump out of Washington and on African soil. I am no fan of Pompeo. His politics anger me; his bigoted take on Islam scares me; and his cozy relationship with alt-right media figures is deeply concerning. But I also fear he’s the only administration official who can help the president heal the geopolitical wounds he’s inflicted on our African partners. And for an administration in dire need of a dose of diplomatic penicillin in the region, a presidential visit to Africa might just be what the doctor ordered. Eric Harris serves as communications director for Rep. Jimmy Gomez, D-Calif. He is also on the Board of Directors of the U.S. Chapter of the Global Campaign for Education. Eric Harris serves as the communications director for Rep. Jimmy Gomez, D-Calif. He is also on the Board of Directors of the U.S. Chapter of the Global Campaign for Education.